Facial hair. No one likes dealing with it on a regular basis. But the problem gets even worse when your facial hair starts turning white. Yes, as you age, your facial hair starts graying and turning white just like the hair on your head. Does that mean it becomes more noticeable or less noticeable? Well, that differs from person to person based on their complexion. Regardless, no one likes looking ungroomed and would probably like to remove it as soon and as safely as possible. But before we look at the many ways that you can remove white facial hair, let’s look at why facial hair turns white in the first place. What Causes Facial Hair To Turn White? Well, just because your facial hair has turned white doesn’t mean that you have to keep looking at it. Here are a few safe and effective ways that you can remove white hair from your face. 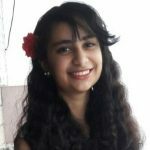 How to remove white hair from face safely? There are tons of different treatments that you can try out at home, at the salon, or at the hands of a dermatologist according to your preferences to remove white hair from your face. Here are a few that can get the job done quite effectively. 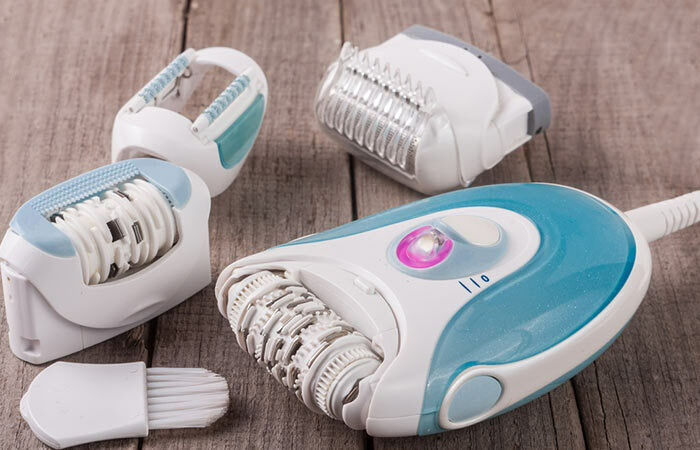 Epilators are electric hair removal devices that pull out facial hair (or body hair) right from its roots. This may sound painful, but it is actually a relatively painless and mess-free way to remove hair when compared to waxing. It is also more effective than shaving as it removes the white facial hair from the roots, thus reducing hair growth over time and with repeated use. All you need to be mindful of is that the white hair has grown to at least a ¼ of an inch in length before using an epilator on it. To prep your face for epilation, start by softening your facial skin with lukewarm water and applying a very thin coat of moisturizing cream to the area where you want to remove the white hair from. Then, glide the epilator in the direction opposite to the hair growth to pluck off your white facial hair. Rinse off your face and pat dry. Now, here’s another method that will remove your white facial hair right from the roots. Tweezing your hair with a stainless steel and sanitized tweezer can prevent it from growing back for at least 4-8 weeks. 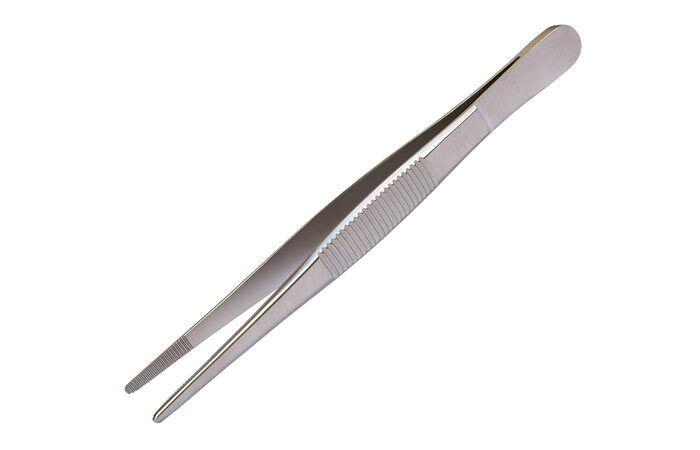 Start out by sanitizing your pair of tweezers with isopropyl alcohol or sterilizing it in hot water. Then, simply pluck out your white facial hair, one strand at a time. Since this is a little more time consuming method, it’s better to tweeze out facial hair when you just want to clean up a few strands or between sessions of other hair removal treatments. 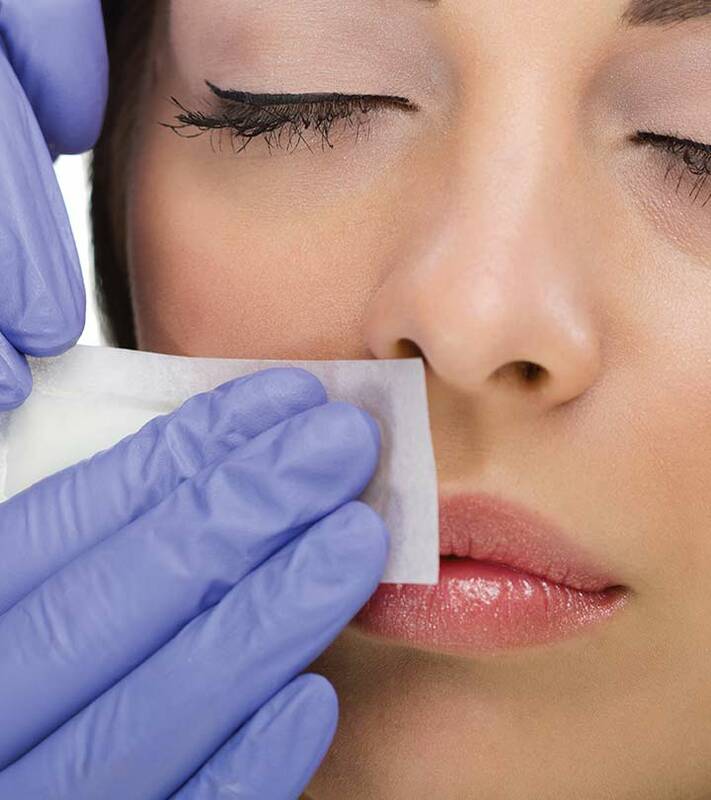 Waxing white facial hair basically involves the same procedure as that of waxing hair from any other part of your body. Hot wax is applied to the facial area from which you want to remove white facial hair. A waxing strip is then stuck on and ripped off to remove the white hair right from its roots. While waxing your white facial hair regularly can reduce their growth over time, it is also a painful method to undergo that can leave your skin feeling quite sensitive. Facial hair removal creams (also known as depilatory creams) are probably the most painless way of removing white hair from your face. These creams basically contain potent chemicals that dissolve your hair, which can then be simply scraped or wiped away. Before you use a facial hair removal cream, wash your face with warm water to soften the hair follicles. Then, apply a layer of the cream on the area that you want to remove the white hair from and leave it on for the time duration recommended on the box. Then, wipe the cream and hair away with a warm, damp washcloth. It is best to do a patch test before using these hair removal creams to make sure you are not allergic to them. A facial spring (or R.E.M Spring, as it is also popularly known as) is basically a metal spring coiled between two rubber handles. It effectively removes the tiniest and finest of white hair from your chin, upper lip, forehead, cheeks or under your jaw. Start off by thoroughly cleansing your face to prevent any breakouts. Then, bend your facial spring until it’s in the shape of an upside-down U. Now, gently roll it over the area from which you want to remove the white facial hair. The spring grabs on to individual strands of hair and yanks them out by the roots. The prickling pain you feel when using this tool is similar to threading and something you get used to after a few uses. Perhaps the best part of using a facial spring to remove white facial hair is that it is easy, convenient, cheap, and precise enough to remove every last strand. 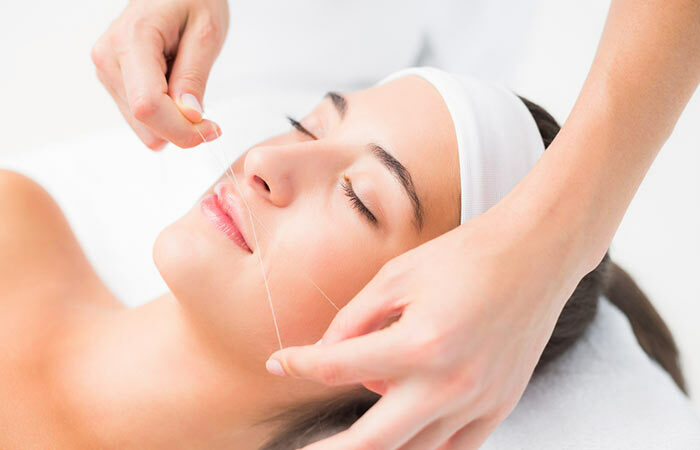 Threading is probably the most common method of removing facial hair. In this method, a length of thread is twisted between the thumbs and forefingers and is glided against the skin to remove white facial hair. Since it only cuts off the hair shaft at the surface of your skin instead of pulling it out from the root, the results it gives are temporary and the white hair can grow back within a couple of weeks. It also quite a painful method of facial hair removal. Dermaplaning is a method of exfoliation and facial hair removal that is used to get rid of dead skin cells, peach fuzz, and facial hair. 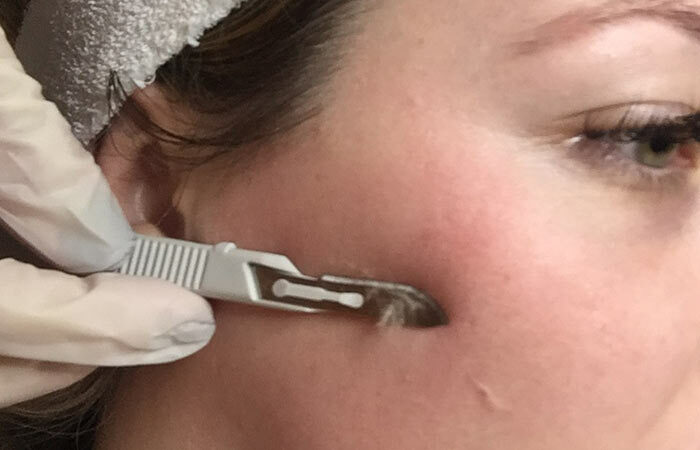 In this method, an aesthetician uses a 10-inch scalpel that curves into a sharp point in gentle upwards motion on your skin to remove unwanted hair. Not only is this a painless way to remove white facial hair, it also leaves your skin looking smoother and glowing. A permanent method of hair removal could be the best option for ladies who have thick white facial hair. 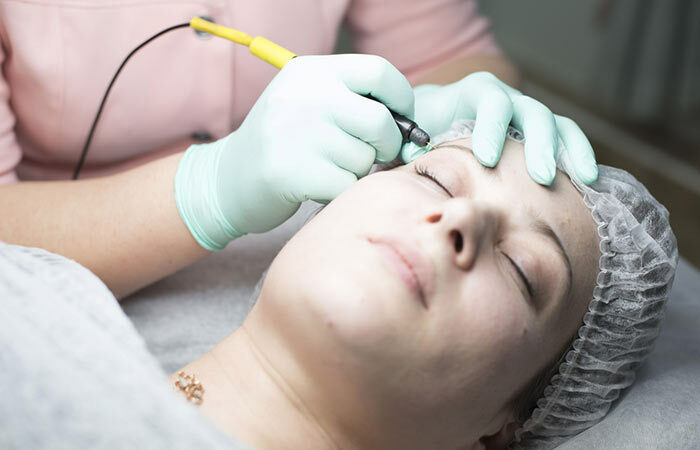 One of these treatments that you can get done by a dermatologist or trained cosmetologist is electrolysis. In this method, a fine probe that is attached to an electrolysis device into a hair follicle that then shoots a current of chemical or heat energy into it to kill it. The unwanted hair is then removed with the help of tweezers. You will need to undergo multiple sessions of electrolysis to fully remove the white hair from your face and it may work out a bit expensive for you, but the long term results are truly worth it. Laser hair removal is considered to be one of the most commonly done cosmetic procedures around the world. In this method, beams of highly concentrated light are directed at the hair follicles that are absorbed by the pigment present in them, thereby destroying the hair. 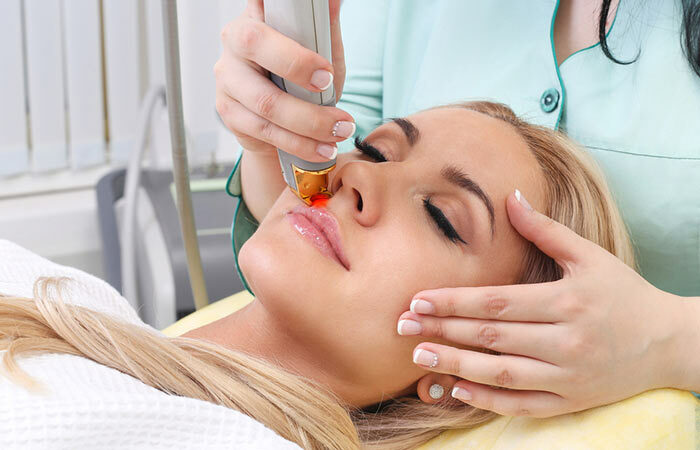 Though laser hair removal is usually not very effective on blonde, red, gray, and white hair, there is progress being made in this technology to cater to light hair needs. 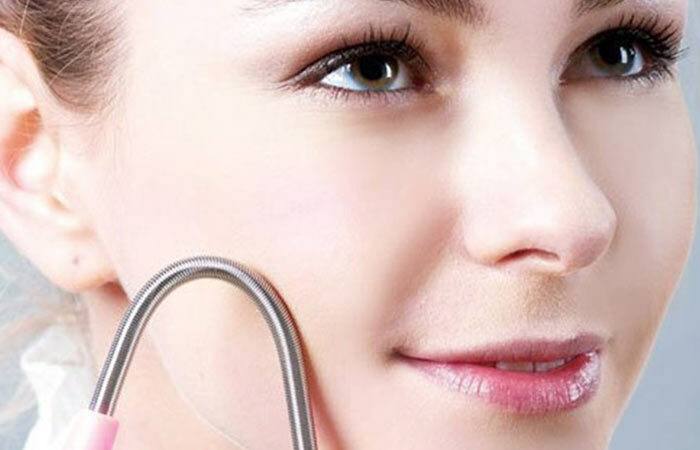 You can consult your dermatologist before undergoing this treatment. No matter which of these white facial hair removal methods you go for, there are a few precautions you need to be mindful of to prevent any adverse reaction from occurring on your skin. It is imperative that you keep your skin clean and well moisturized before you undergo any facial hair removal treatment to make it less painful. Thoroughly cleanse your face before and after each hair removal treatment to prevent breakouts and infections. No matter what method you opt for, make sure you do it at regular intervals to ensure that the white facial hair growth reduces over time. So that was our rundown of the most effective hair removal methods for white facial hair. Comment below to let us know which one you would opt for!